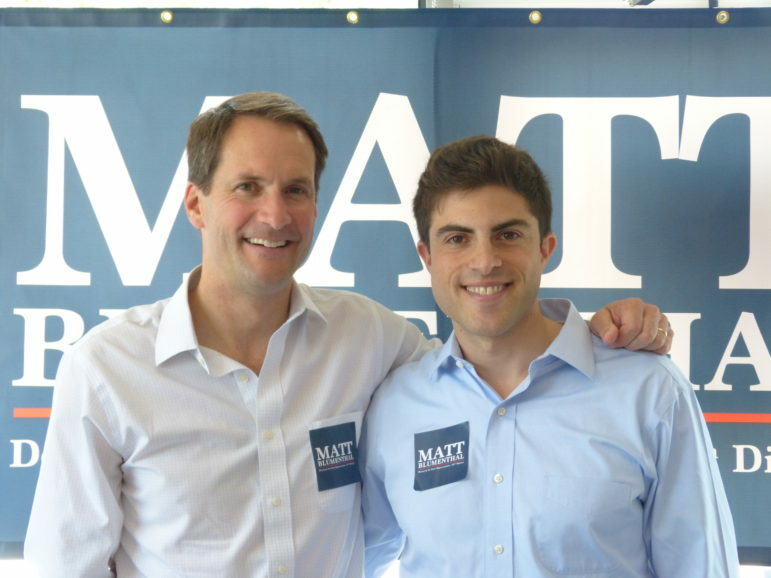 U.S. Rep. Jim Himes on Saturday endorsed Matt Blumenthal, the Democratic candidate for state representative in the 147th District. Blumenthal, who won the endorsement of the party at a convention, is a veteran, trial attorney and community volunteer. He’s also the son of U.S. Sen. Richard Blumenthal, a Democrat from Greenwich and the former longtime state attorney general. From left: U.S. Rep. Jim Himes with Matthew Blumenthal, Demcratic candidate for state representative in the 147th District. The candidate is running against Anselmo Graziosi, who received the Republican Party endorsement at a recent district convention. An attorney, member of the Stamford Board of Representatives and former deputy mayor of Glen Cove, N.Y., Graziosi had run for the seat as a Democrat and lost to Blumenthal at a Democratic district convention. Himes endorsed Blumethal in the Springdale Diner at 901 Hope St. in Stamford. The 147th District includes neighborhoods in North Stamford and Springdale, for the most part, but also includes, District 3, a voting district in Darien along Hoyt Street and including surrounding streets. State Rep. William Tong, a Stamford Democrat, currently represents the district. Tong is the Democratic Party endorsed candidate for state Attorney General. Matthew Blumenthal commanded a rifle platoon in Afghanistan as an infantry officer in the U.S. Marine Corps Reserve. Afterward, in law school, he worked to get benefits for veterans he said were unfairly discharged, and he worked to help pass a state law to reduce veteran unemployment. An attorney, Blumenthal also serves on the Board of the Boys and Girls Club of Stamford and helps supervise a Yale Law School public interest project “protecting vulnerable Americans from Trump Administration’s overreaches,” according to a news release from his campaign.